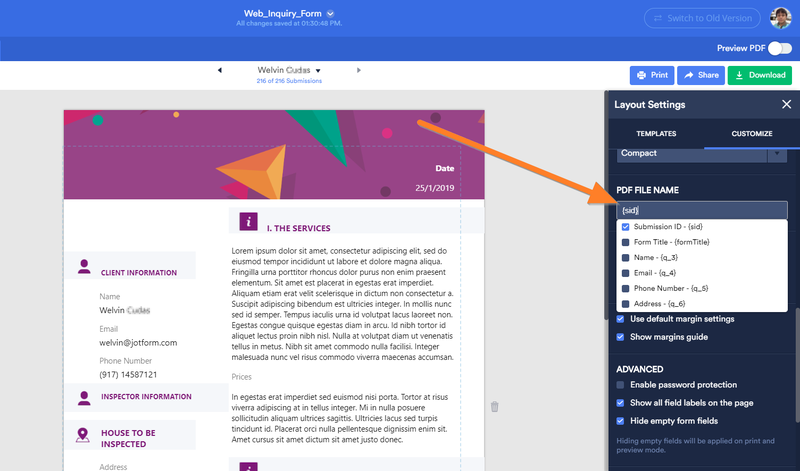 Our new PDF Editor now lets you create a beautiful PDF template for your submissions, and at the same, create multiple PDF documents that you can also use send a personalize PDF based on the user input in the form. 1. Go to My Forms page and select the form that you want to customize its PDF. 4. In the PDF Editor, go to the Customize tab. 5. Navigate to the middle part of the window. And that's how you change the file name of the PDF document of your forms. If you have any questions, any difficulties changing the name, please let us know in the comments below or head over to our support forum.